Corvette Product Manager Harlan Charles and Corvette Exterior Design Manager Kirk Bennion hosted the annual “What’s New For Corvette” seminar at the NCM Bash this year while Chief Engineer Tadge Juechter was out on the west coast with Corvette Racing in Monterey. 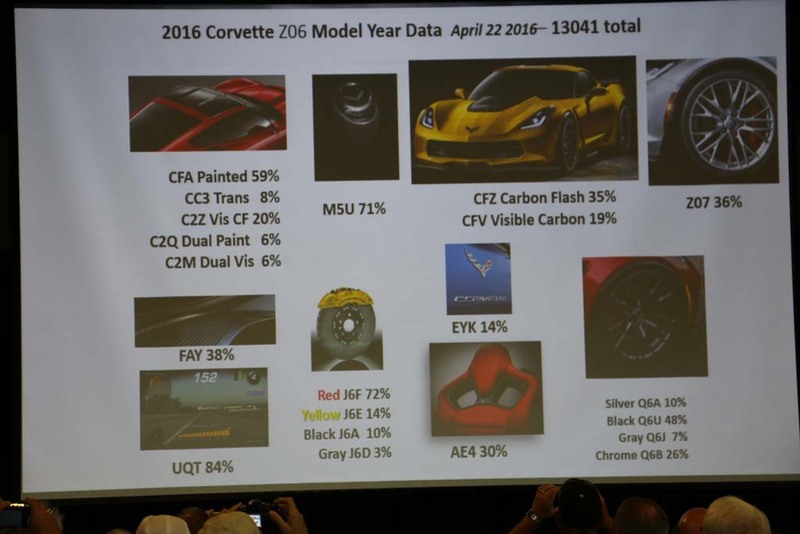 This was a different kind of Bash presentation than previous years as most of the major announcements were already known as the 2017 Corvette Grand Sport was revealed a month earlier at Geneva while the four new colors and some new options were confirmed in the 2017 Corvette Order Guide which was made available earlier in the week. 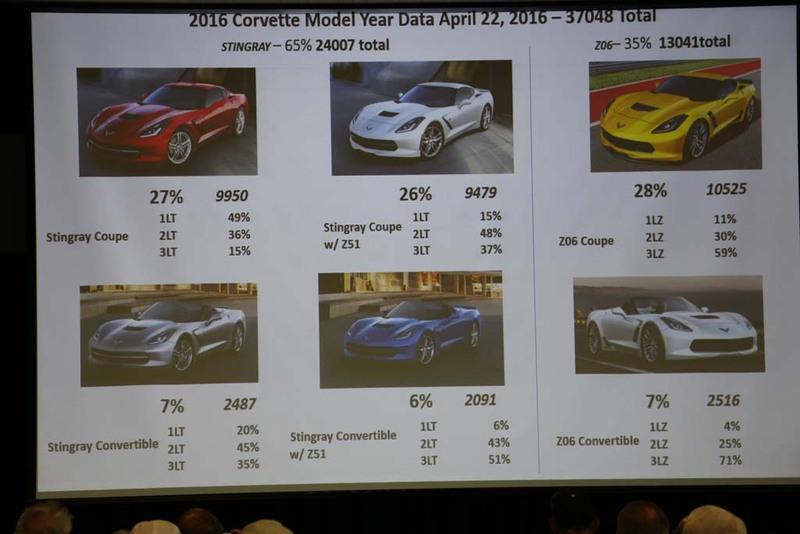 That being said, it’s always great to have members of the Corvette Team around to ask question and gain insight on the new models and we took full advantage of it during the bash.Like these seminars always do, Harlan first spoke about the latest news for the 2016 Corvette including production statistics. 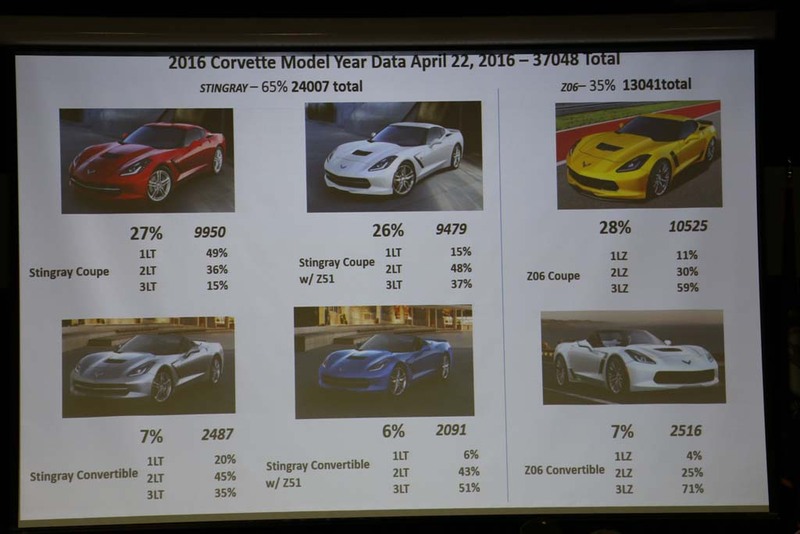 As of April 22nd, Chevrolet has produced 37,048 Corvettes for 2016 and the final count when production ends in June will be somewhere between 38,000-40,000 according to Harlan. 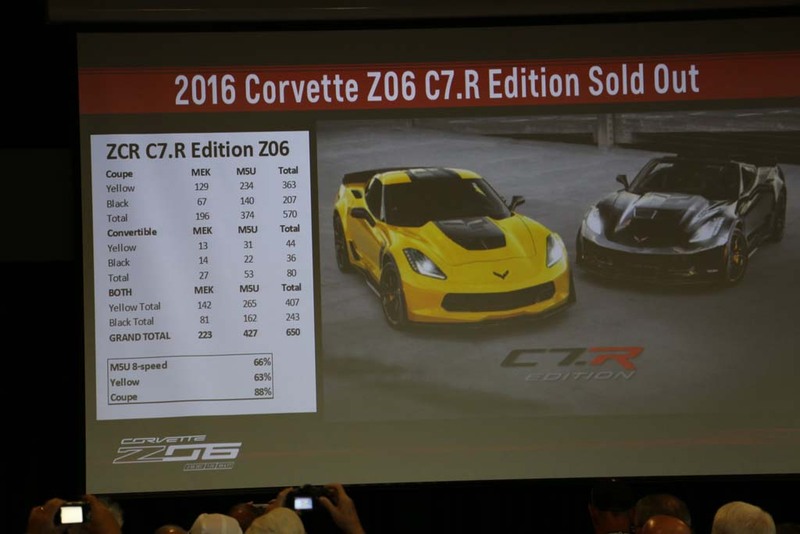 That will eclipse the 37,288 that Chevrolet sold in model year 2014 and it may end up being one of the highest production model years in the modern history of the Corvette. 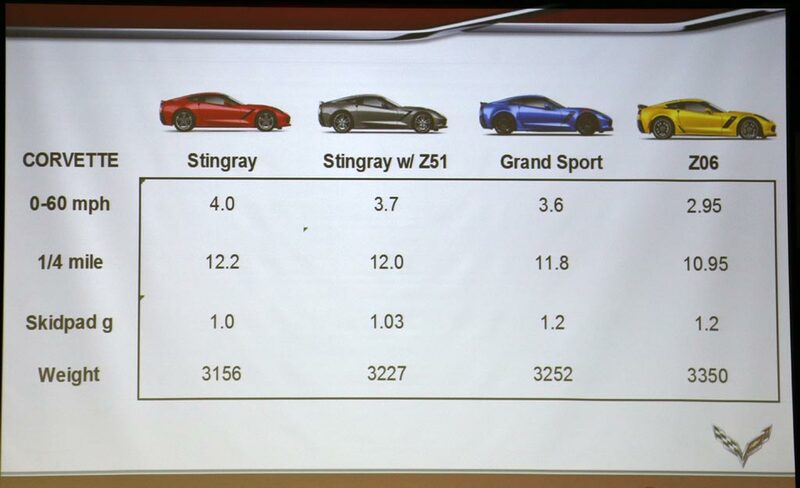 The breakdown in production numbers between the Corvette Stingray and Z06 is 65% (24,007) Stingrays produced vs 35% (13041) Z06s and the breakdown among body styles is 80% coupes and 20% convertibles. For Stingray buyers, 81% are opting for the 8-speed automatic transmission while 71% of Z06 buyers are checking that box. Harlan says one of the considerations for offering the Grand Sport was due to customers asking for the car. 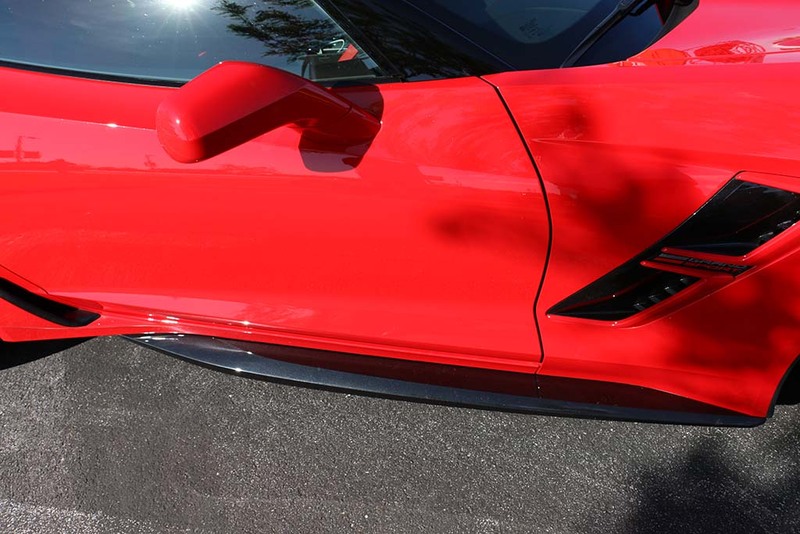 According to Harlan, those requests for a C7 Corvette Grand Sport began rolling in about five minutes after the Stingray was introduced in 2013. 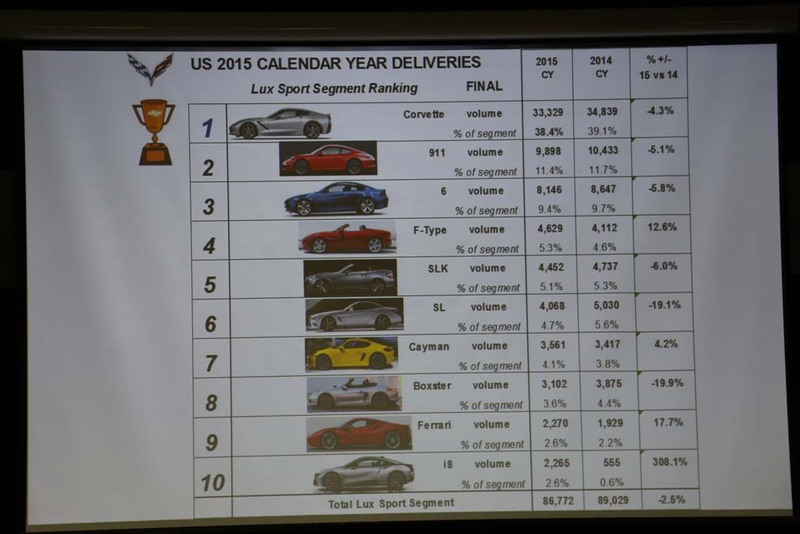 And if you think about the offerings for the C7 Corvette, a Grand Sport does make sense. 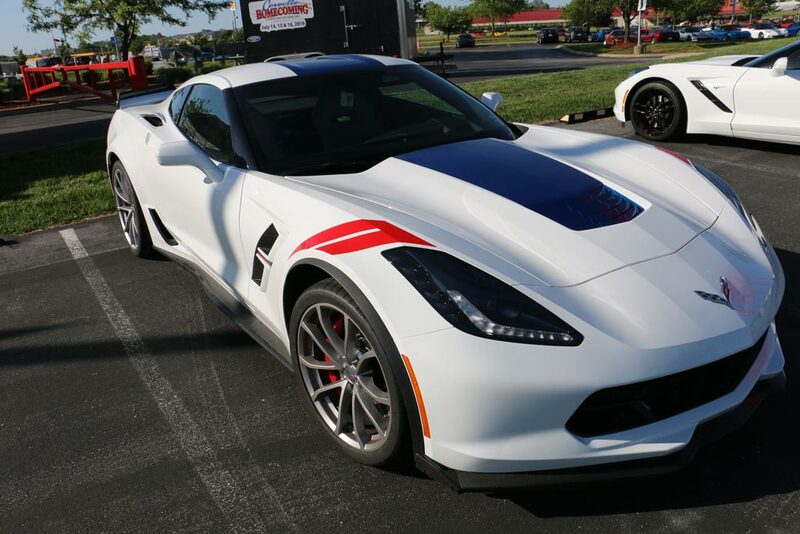 Like the choices for Coupe vs Convertible and Automatic vs Manual, you now have a choice for a widebody design Corvette that is offered with a supercharged 650 hp LT4 or the naturally aspirated 460 hp LT1. 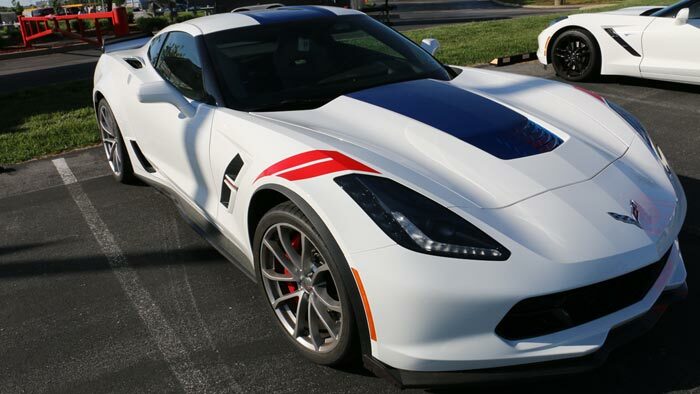 The Grand Sport will be offered with the same 1LT/2LT/3LT equipment packages as the Stingray and specific options just for the Grand Sport are offered as well. 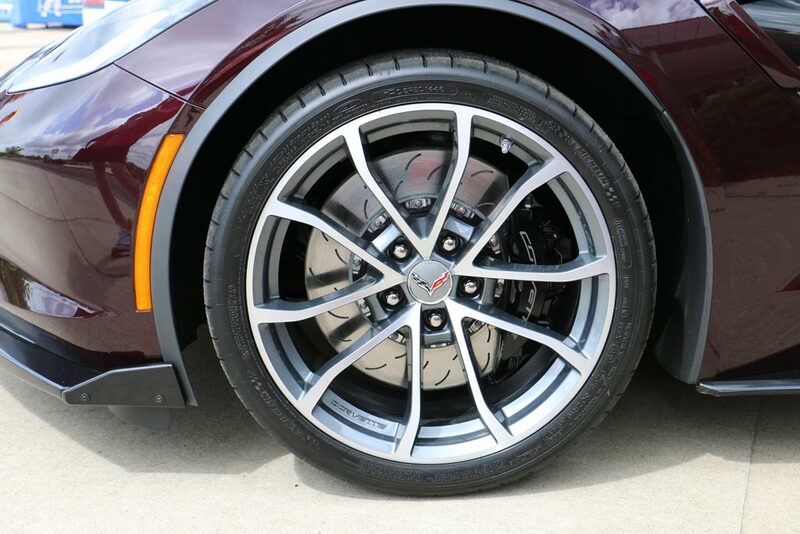 The Grand Sport will be reintroducing the “Cup Wheels” which first made their debut on the 2012 Corvette Centennial Edition and will be available in the following colors: Pearl Nickel, Black, Satin Black with a Red Stripe, Machined or Chrome. Standard on the Grand Sport is Magnetic ride control, specific stabilizer bars and springs. The eLSD (electronic limited slip differential) is also standard. 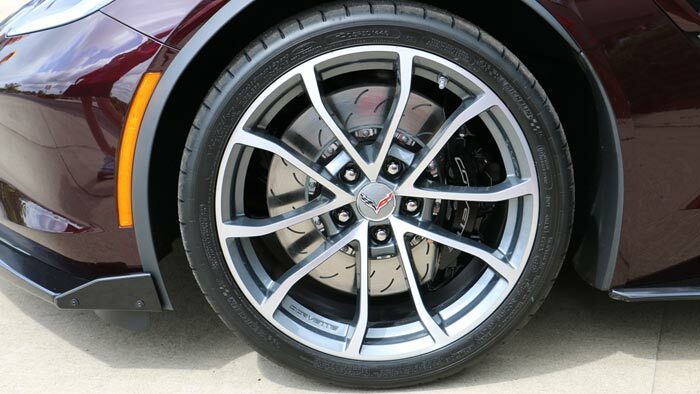 Perhaps our favorite option is the J57 Carbon Ceramic brakes which you can now order for the Grand Sport. Its the first time they’ve been offered outside of Corvette Z06/ZR1 models. 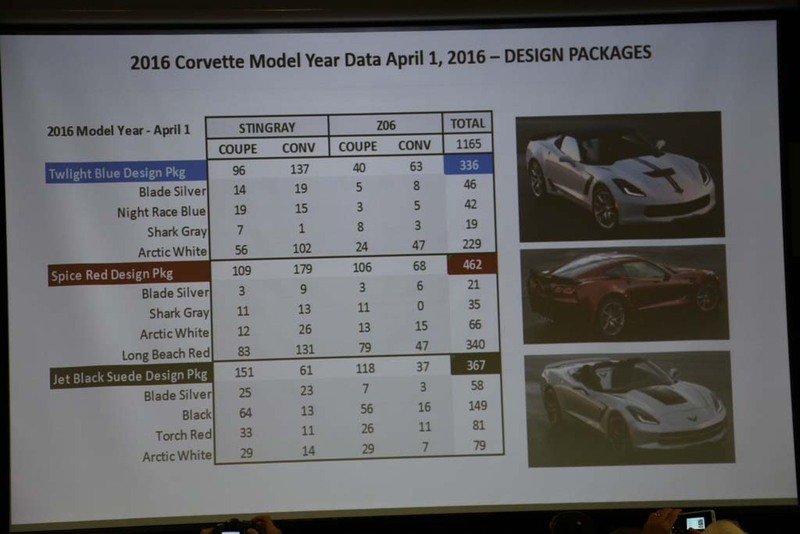 The Grand Sport Corvette will also be bringing back the Heritage Package known as RPO Z15. It includes six Grand Sport Fender Hash Mark colors and five optional center stripes. The Hash Mark colors are Torch Red, Shark Gray, Carbon Flash, Yellow, Hyper Green, Volcano Orange and Carbon Flash (Black Metallic) while the stripes are available in Arctic White, Shark Gray, Laguna Blue, Torch Red and Carbon Flash. 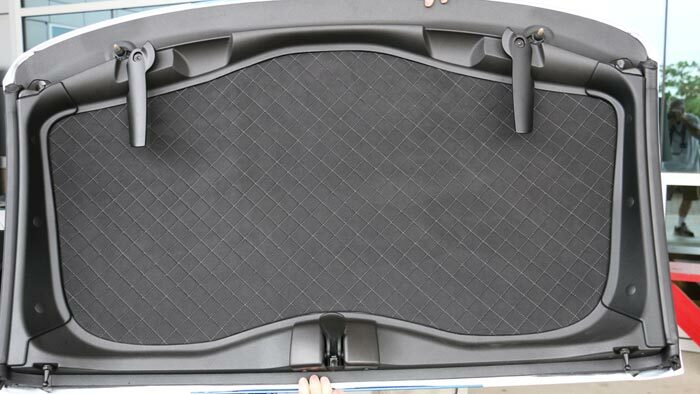 When choosing the optional center stripes, the hood air extractor vent is color matched to the stripe. So if you choose blue, your hood vent will be blue as well. For those that order the Grand Sport Heritage Package, you will also get a set of hash marks next to the center infotainment center on the grab bar. Every Grand Sport will have its own specific interior plaque featuring the original Grand Sport and the stripe on the plaque is color-coded to your interior. 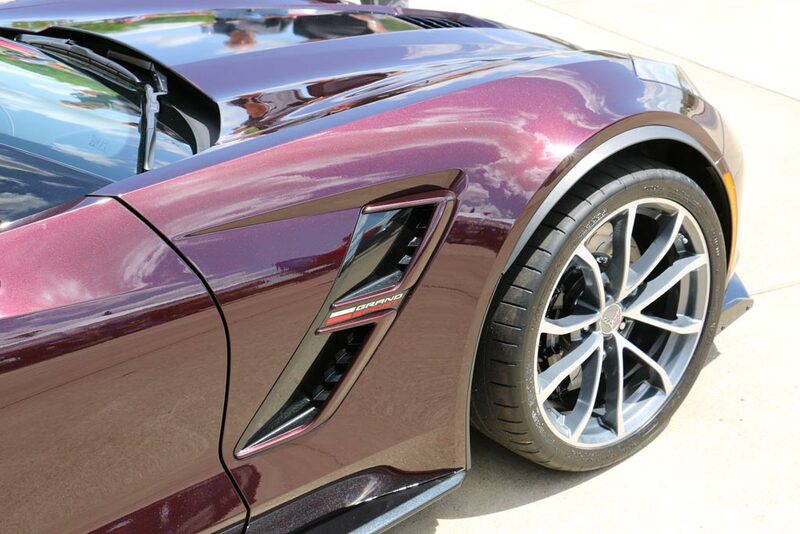 The Collector Edition Grand Sport will be limited to 1,000 cars and will contain a unique VIN sequence. All of these are 3LT and it will be offered in Coupe or Convertible body styles. The Collector Edition features the Watkins Glen Gray with Tension Blue interior and hash marks along with Black stripes. 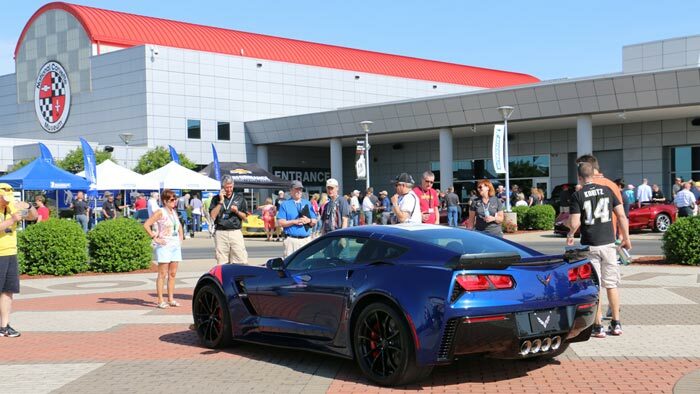 Later in the presentation, Harlan shared a video of Corvette engineer Jim Mero driving the 2017 Grand Sport at VIR. The Grand Sport finished the Grand Course in 2:45.18. 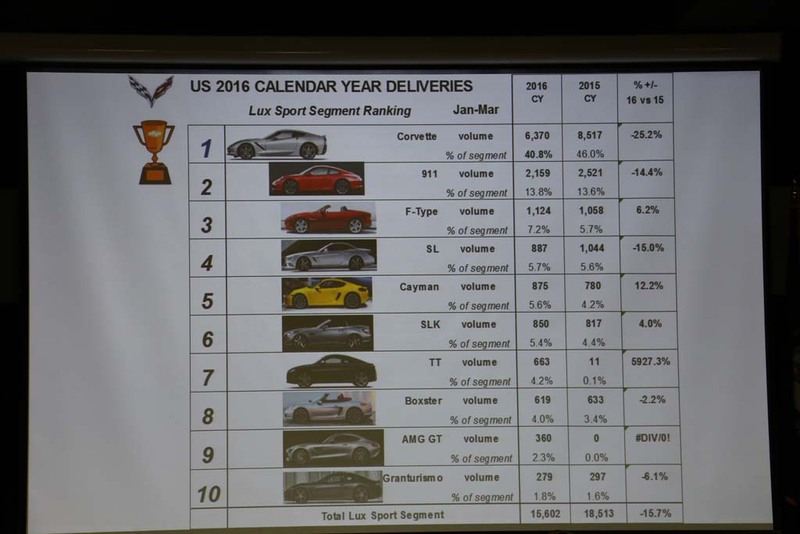 For reference, Mero’s 2016 Z06 lap time was 2:41.3 and the Grand Sport finished just ahead of the C6 ZR1 time of 2:45.63. The crowd enthusiastically responded when asked if that video should be put on youtube so hopefully they will follow through on that. 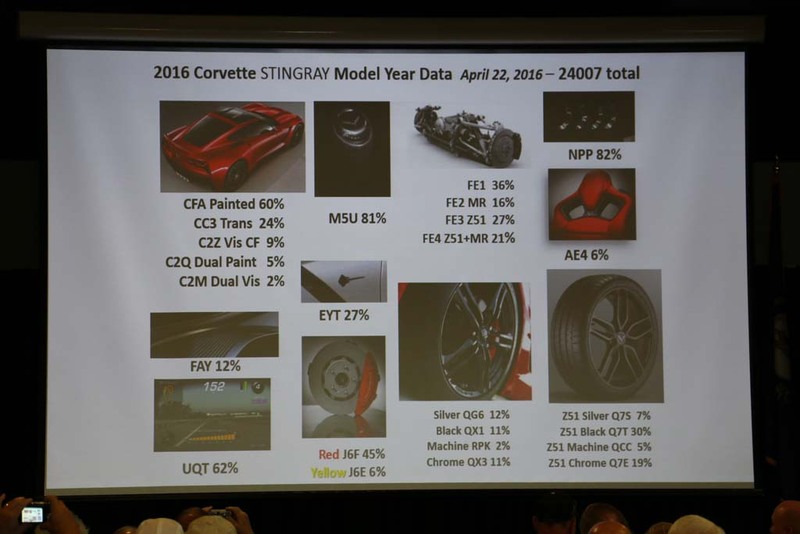 Kirk Bennion took the mic and went through the various color combinations for the Grand Sport and then got into some of the new changes for the 2017 Corvette Stingray as well. 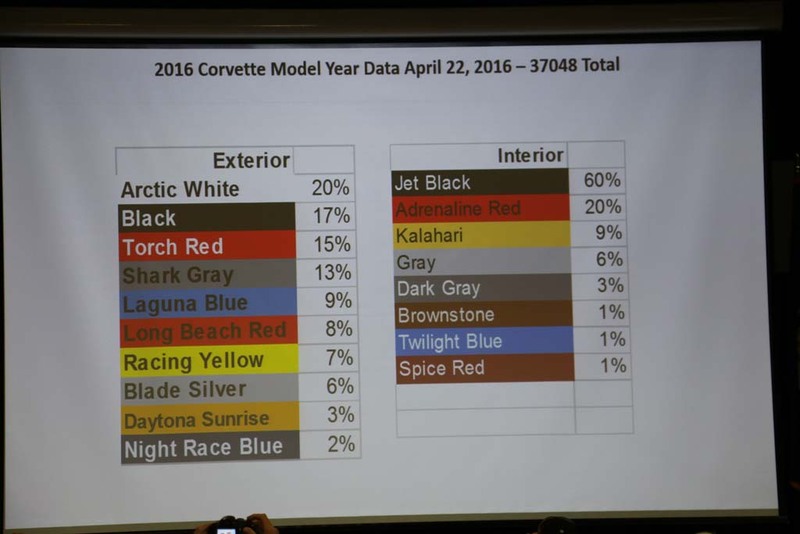 Of course, the major changes are the four new colors, Watkins Glen Gray, Black Rose, Sterling Blue and Admiral Blue. Going away are Shark Gray, Daytona Sunrise Orange, Laguna Blue and Night Race Blue. For 2017, the three design packages offered last year all return. They are Spice Red, Twilight Blue and Jet Black Suede. 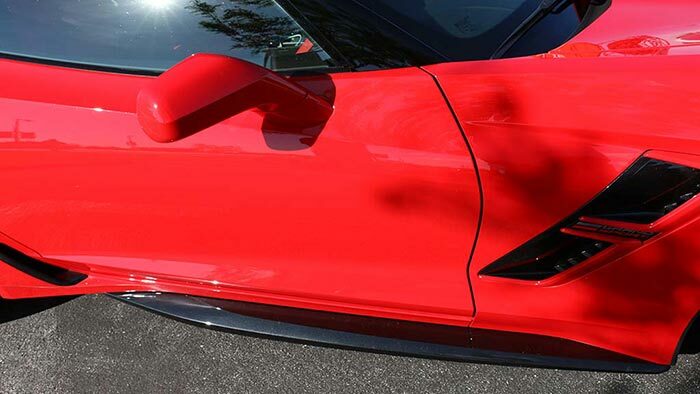 The Black wheel with Red stripe is now offered for all Corvettes from the factory instead of it being an optional wheel from the Genuine Corvette Accessories catalog. 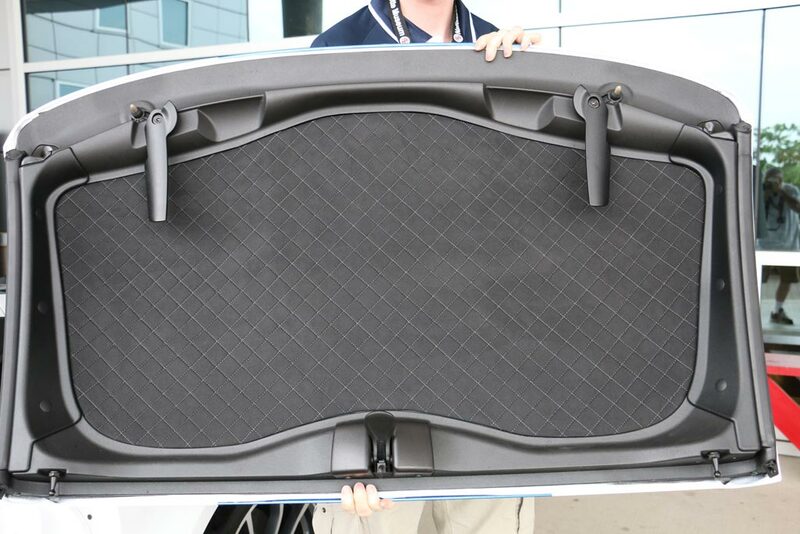 For the interior, the 2017 Corvette will offer a a Black quilted suede headliner on 3LT/3LZ Coupes and the Kalahari and Gray headliner and upper surround are color keyed on Coupes. 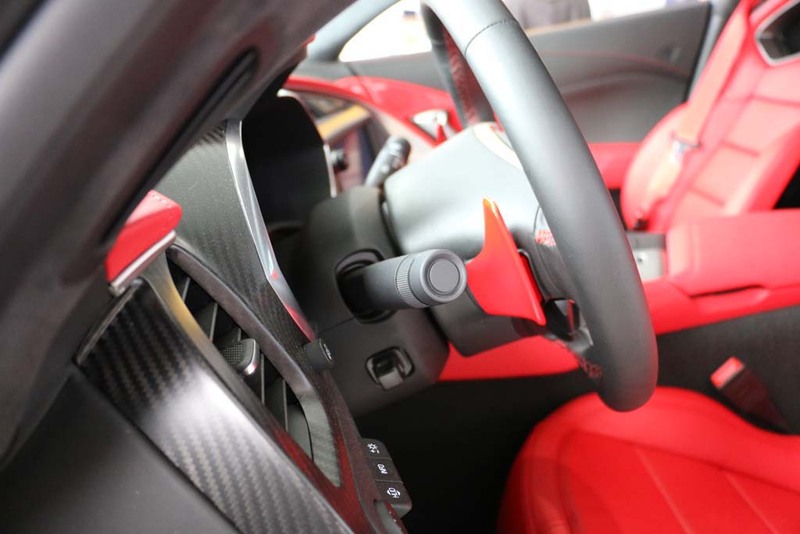 Other options include a new Red Seat Belts option as well as the new yellow and red paddles (paddle shift or active rev) are color-coded to Yellow and Red interior stitching. 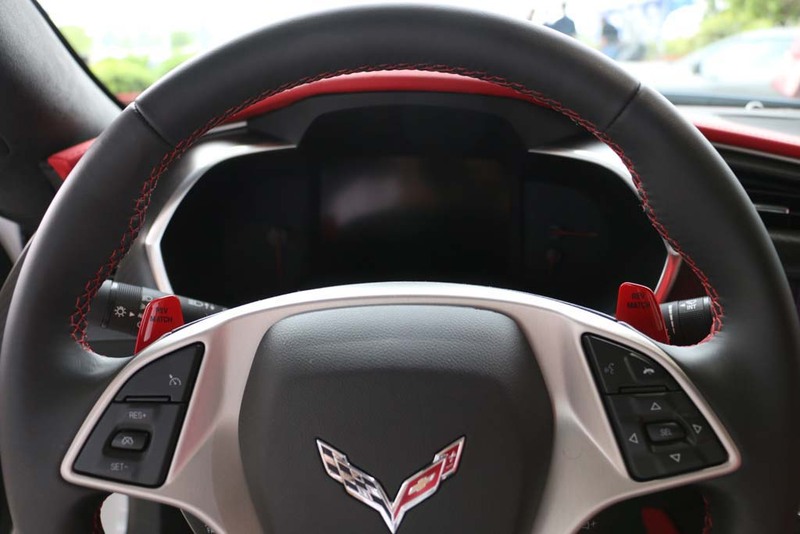 So if you choose a red stitching, you’ll get the red paddles on the steering wheel. Brownstone interiors are discontinued for 2017 as well. There are some minor changes to the Corvette’s Performance Data Recorder. The new updates for PDR include a mute option for recording, enhanced recording screen shows the overlay selected, the odometer added to the playback overlay data and the driver mode is displayed in the track overlay.